On February 20, 2014 the Founder, Brenda Parson of Volunteer2Serve&Give was interviewed by the Creator Vernetta Freeney of Fusion Tour from Houston, TX. The Founder, Brenda Parson of Volunteer2Serve&Give was interviewed by the Producer of the Steve Harvey TV Show on Giving Back to the Community on February 13, 2014. Black Celebrity Giving nominates Volunteer2Serve&Give for the Southeast Region Award on December 28, 2013. November 14, 2013 is National Philanthrophy Day and the Founder, Brenda Parson of Volunteer2Serve&Give was a guest speaker on The Lakesha Womack Show speaking on Creative Ways of Giving Back..
Black Celebrity Giving named Volunteer2Serve&Give during National Philantrophy Month in November 2013. The Founder, Brenda Parson of Volunteer2Serve&Give was interviewed by WBTV NEWS on October 15, 2013. The feature was Diaper Drive for Single Moms. The Founder, Brenda Parson of Volunteer2Serve&Give was a guest speaker on WGIV 103.3FM radio on September 7, 2013 at the Giving Boutique and was interviewed with WBTV News as the Charlotte Ambassador. The Founder, Brenda Parson of Volunteer2Serve&Give received the Proclamation from the Mayor's Office from the City of Charlotte, NC on September 7, 2013 and it was declared that this day is called The Giving Boutique Day. 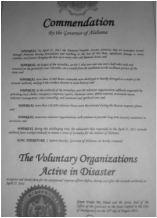 Volunteer2Serve&Give Founder-Brenda Parson received a Commendation Certificate by the Governor of Alabama for volunteering on April 2011. Volunteer2Serve&Give new website was launched on March 31st, 2012. The online portal is an informative website.